Miniaturized Nuclear Power Plant? U.S. Reviewing Proposed Design : The Two-Way A company has submitted a design for what it describes as a "modular" nuclear power plant — a radical departure from other nuclear plants. Each module would be small enough to fit on a flat-bed truck. 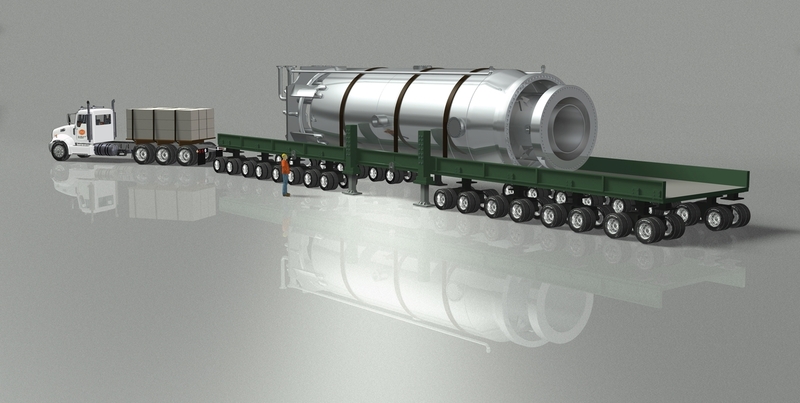 NuScale power wants to build modular nuclear reactors small enough to fit on the back of a truck. NuScale Power based in Portland, Ore., has submitted a design for what it describes as a "modular" nuclear power plant. Each module is a self-contained 50-megawatt nuclear reactor loaded with standard uranium reactor fuel. Modules would be assembled at a factory-like facility and then delivered to power utilities and other clients. "Miniature" in nuclear terms is still pretty big. The modules are small enough to fit on flat-bed trucks, but they would stand nearly nine stories tall. Moreover, a power plant would probably require several modules hooked together like giant batteries. Of course, they'd need to be operated by professional nuclear engineers. But the design — a radical departure from other nuclear plants — would also have advantages. Each module uses less uranium fuel, making a large-scale meltdown far less likely. The fuel would be housed in a special containment vessel that would be submerged in a pool of water, an added safety feature. And rather than using pumps of the sort that failed during the Fukushima nuclear disaster, the reactor would circulate the water using natural convection. The company maintains the design is simpler and safer than existing reactors. 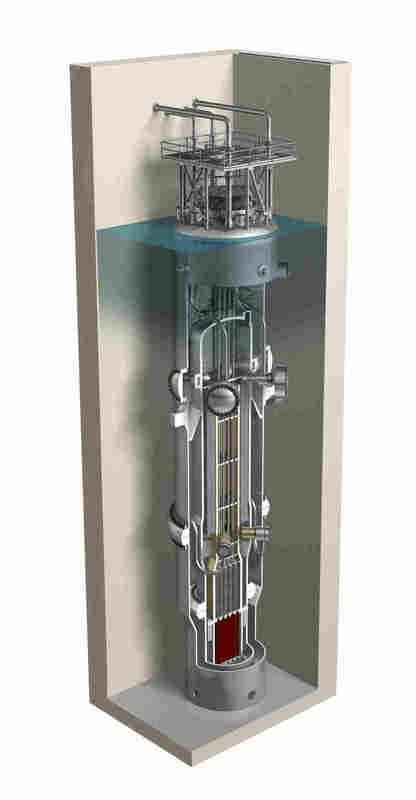 NuScale formally completed its design submission to the Nuclear Regulatory Commission on Thursday. The 12,000-page application will now undergo a lengthy review by the NRC, which must approve the design before construction can begin. The company believes that 570-MW project can be completed for less than $3 billion. By comparison, a new 1,150-MW reactor at Watts Bar in Tennessee cost around $4.7 billion and began operation in 2016 after years of delays. McGough says the company envisions the modules also could be used in other ways. For example, he says, they could be installed near wind turbines as backup when the wind isn't blowing. Or they could be used by the military to power bases that need electricity even if the grid goes down. About a dozen clients in the U.S. and abroad are looking at the technology, he says. But not everyone is convinced smaller is better. Ed Lyman, an analyst with the Union of Concerned Scientists, says the electricity generated by a smaller reactor is more expensive than that generated by a larger one. Companies such as NuScale hope to offset the higher costs by saving on the cost of construction, but Lyman isn't convinced. He worries savings will come at the cost of safety. He says NuScale wants to do things like reduce the size and strength of the reactor containment building and the number of personnel needed to operate the plant. "NuScale is proposing major reductions in all of these areas relative to current NRC requirements for large reactors, based on the assertion that the reactor will be safer," he says. "We've eliminated a number of systems that are not required to protect the core of our plant," McGough acknowledges. But he says that's because the small, modular designs are inherently safer than large reactors. He believes the NRC review will clearly show that the modular designs can meet or exceed existing safety standards. The NRC will take its time to make sure the design meets its safety standard. McGough says the review will take over three years. If it wins approval, NuScale hopes to switch on its first plant by 2026.